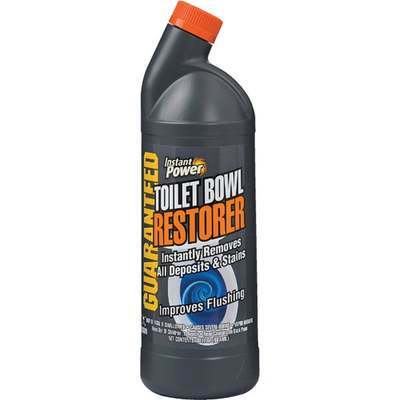 Instant Power Toilet Bowl Restorer is an innovative product focused on cleaning your toilet and bringing it back to original performance. Instantly removes rust stains and dissolves lime, calcium, and other mineral deposits in clogged flush holes. This allows tank reservoir water to enter the bowl faster during flushing, facilitating a more powerful flush. Conserve water by eliminating the need to reflush. Toilet Bowl Restorer is safe for use with septic systems. Let the product remain in the bowl for at least 15 minutes before flushing. This will give a better result and remove more of the deposits. 30 oz. liquid.